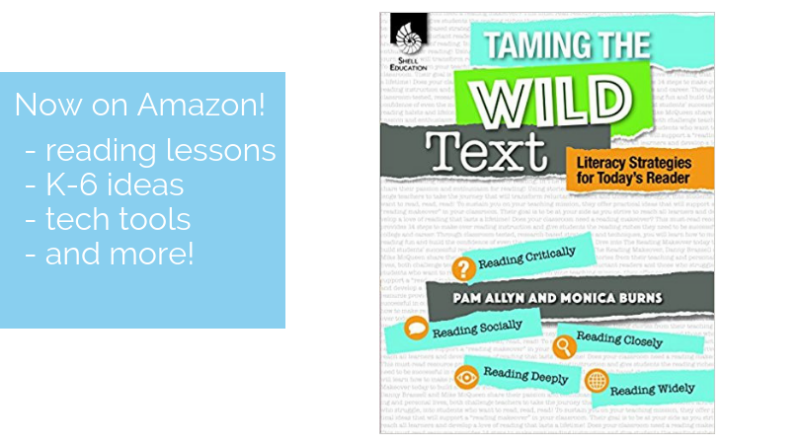 Last year I met an inspiring educator with a passion for high-quality, literacy instruction. 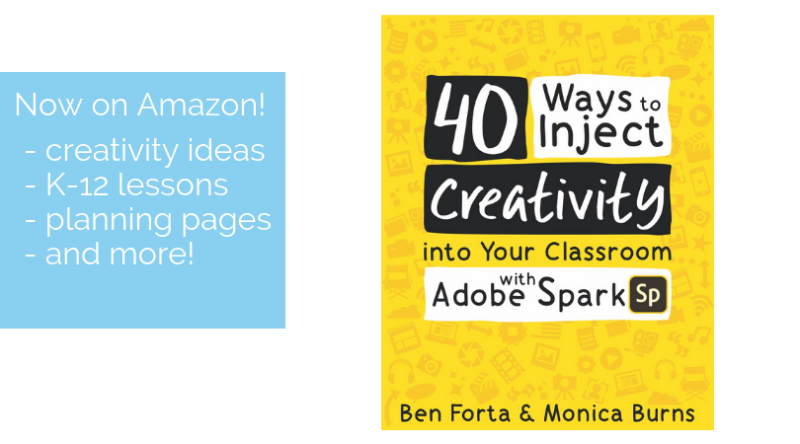 When I heard about the topic of her book, I was excited to find a resource that focused on an essential component of any lesson. Dr. Molly Ness is the author of Think Big With Think Alouds, Grades K-5: A Three-Step Planning Process That Develops Strategic Readers. She offers lots of tips for think alouds, and I’m excited to share some with you today! After talking with Dr. Ness about her book, I knew I had to share her thoughts and actionable tips for think alouds. Are you using think alouds regularly in your classroom? 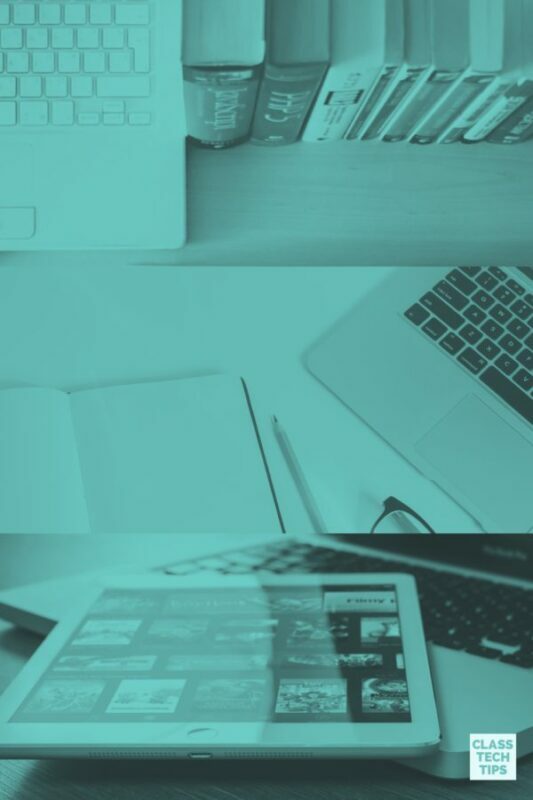 I’ve compiled a list of tech tools to energize your think aloud routine. 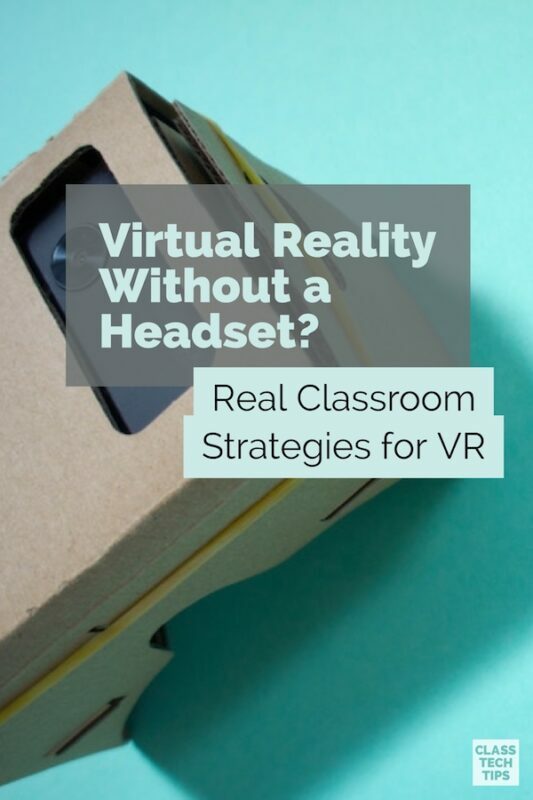 If you’re just getting started, this post contains an interview with Dr. Ness where she shares her experience as well as tips for think alouds. Think alouds are a powerful strategy to model your thought process for students. As a classroom teacher, my read aloud books were full of sticky notes. These sticky notes reminded me to pause as I read — but not to pose a question to my class. Instead, it was my reminder to stop and think aloud so students could hear my thoughts as I read. As they watched me make meaning of the text, they were able to see the thought process a reader has as they tackle new text. You can use think alouds across subject areas. As you model how to solve a math problem in your classroom, let students hear how you decide which algorithm to use. As you demonstrate a science experiment to your class, let students hear as you think aloud and restate safety protocols or make decisions. Think alouds are purposeful and strategic to help students grow as learners and take ownership of their learning. Dr. Molly Ness is an associate professor in childhood education at Fordham University’s Graduate School of Education. She is a nationally recognized literacy expert and supports both educators and parents. Dr. Ness is a fellow Corwin author and wrote the book, Think Big With Think Alouds, Grades K-5: A Three-Step Planning Process That Develops Strategic Readers. She was kind enough to answer a few questions about her work and share tips for think alouds. Several years ago, I attended a conference session where researcher Doug Fisher made a quick comment stating, “We all know that think alouds are incredibly powerful, but teachers don’t readily do them in their classroom instruction.” I just couldn’t get that comment out of my mind, and I began a research study to explore ways to support teachers in thinking aloud. The research study led to several articles, and eventually this book. The vast majority of my research has focused on reading comprehension, beginning with my dissertation where I looked at the frequency of comprehension instruction in secondary classrooms. I’ve always found the statistics about the number of students who struggle to make meaning of text staggering and unacceptable. I see think alouds as an easy-to-implement, widely applicable strategy to improve comprehension across grade level, content area, and text genre. How can educators make Think Alouds a priority in their work? Teachers can prioritize think alouds by using “I” language to model their language as they read aloud to students – in small-group lessons, in whole-class read alouds, and in content area texts. As they use “I” language (meaning “I wonder why…” and “I’m getting the sense that…”), we provide kids with a mental model of how to be successful in comprehending text. 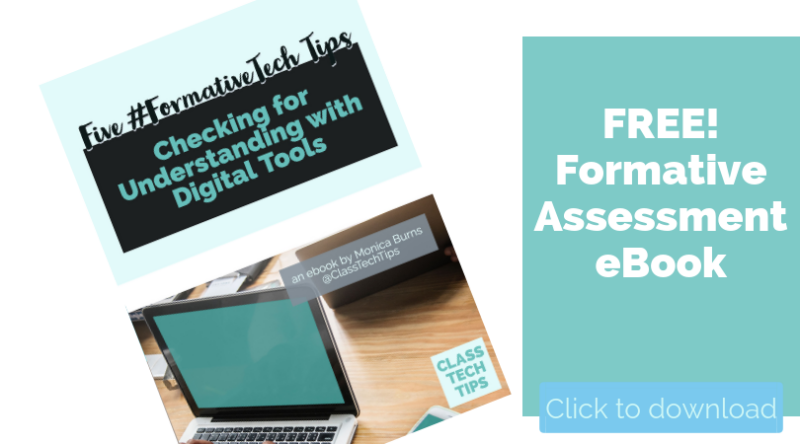 What are your “must-have” tech tools for Think Alouds? 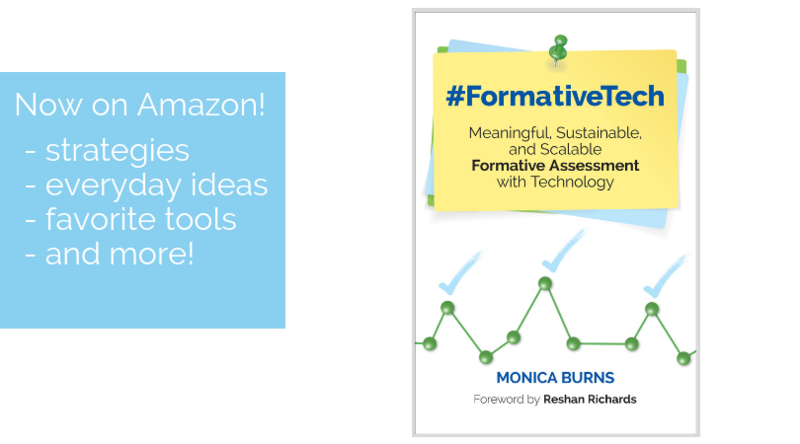 Is there a way to leverage the power of digital tools during this practice? The most readily available digital tool to use for think alouds are simple video recording software and capabilities. In my research study – highlighted in the book – teachers found that videoing themselves and watching their own instruction was a transformative experience in building their capacity to think aloud. I’m also a fan of using programs like NowComment, which allow teachers to annotate text with their think alouds and share them with others. Do you have advice for an educator who is new to think alouds? 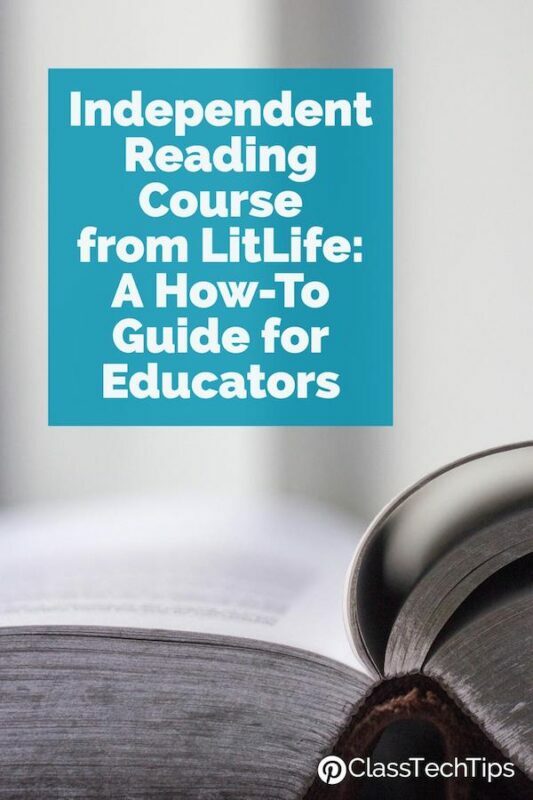 My advice would be to jumpstart your think alouds with the “I” language sentence starters provided in the book and online in the Corwin resource library. I’d also encourage teachers to use video analysis to watch experienced teachers think aloud and also to video themselves thinking aloud. I hope that teachers will embrace a new twist on this a tried-but-true strategy. Think alouds are powerful, easy-to-implement, and highly effective in building metacognition in readers of all ages. 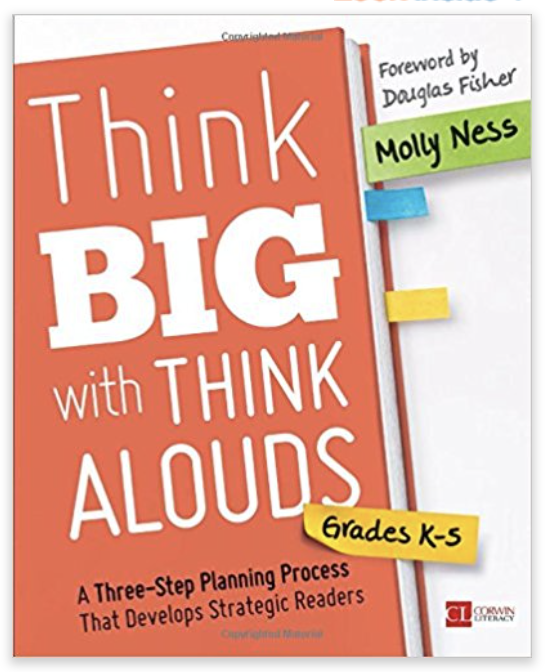 Think alouds can take different forms, and Dr. Ness shares a clear process in her book Think Big With Think Alouds, Grades K-5: A Three-Step Planning Process That Develops Strategic Readers. 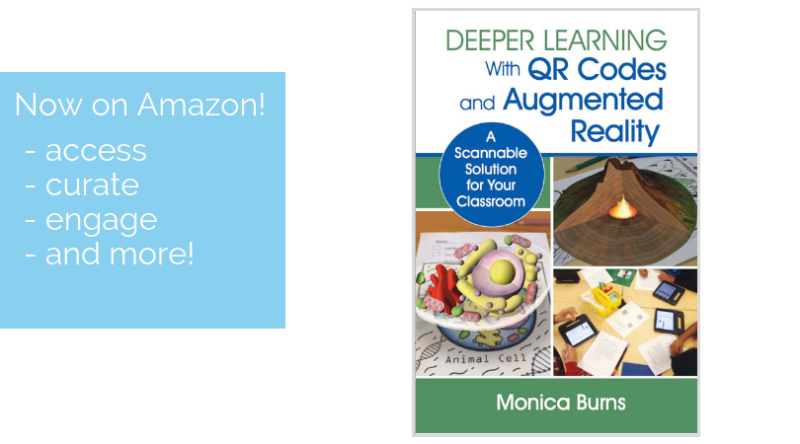 You can leverage the power of different digital tools as you use think alouds in your classroom. 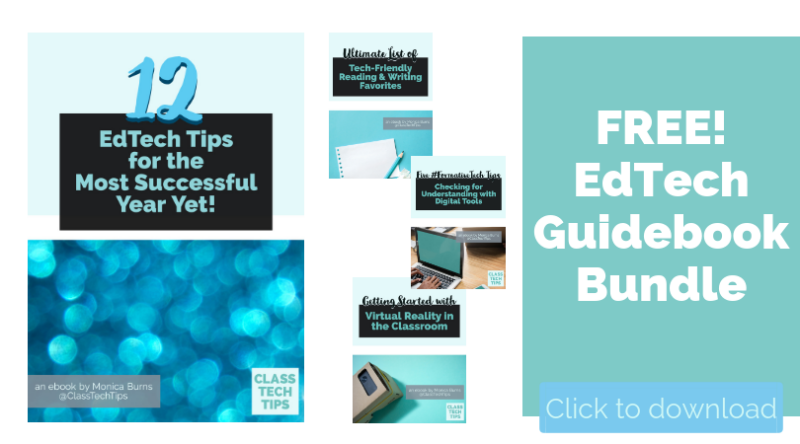 Earlier this year I shared a new book on video coaching from the founder of Edthena. 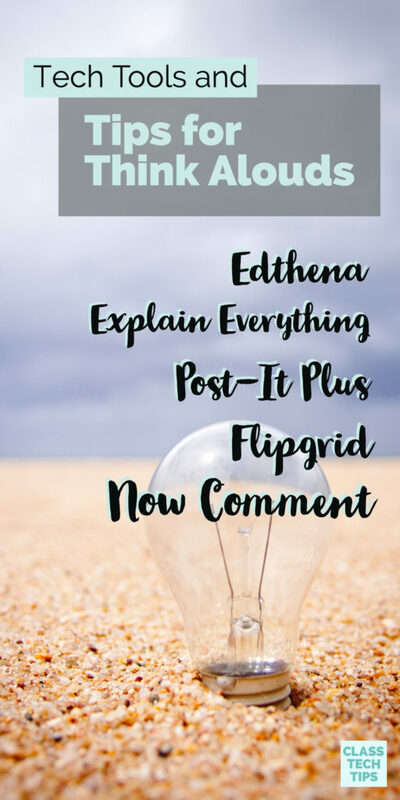 Edthena is a tool for educators to support classroom observations. As Dr. Ness mentioned, reflection is essential and recording your lessons can be extremely helpful. Whether you decide to solicit peer or coach feedback, Edthena is a useful tool for video recording. I’m a big fan of screencasting tools, especially the dynamic Explain Everything. A few years ago I shared how this screencasting tool became available on Chrome, and you’ll now see significant updates from the folks at Explain Everything. 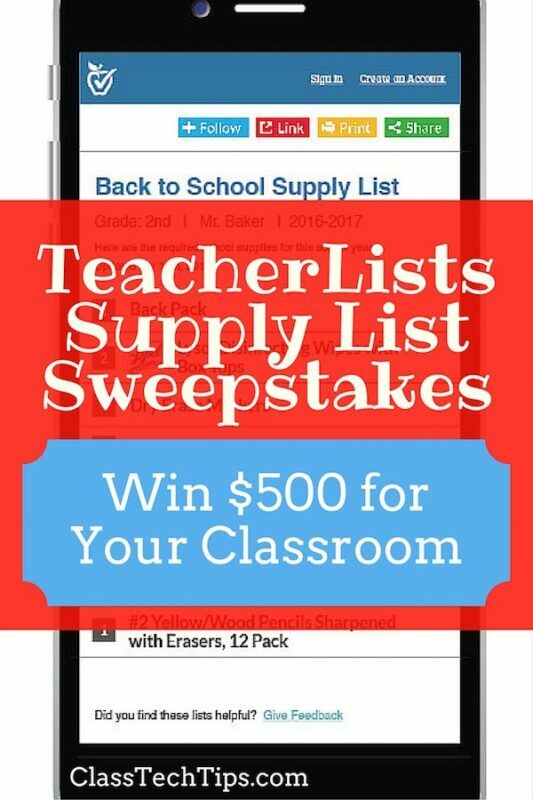 Planning on using think alouds in a flipped classroom? You may want to create screencasts that capture your voice as you explain a process. As you think aloud, Explain Everything can capture your voice as well as anything you write on your screen. 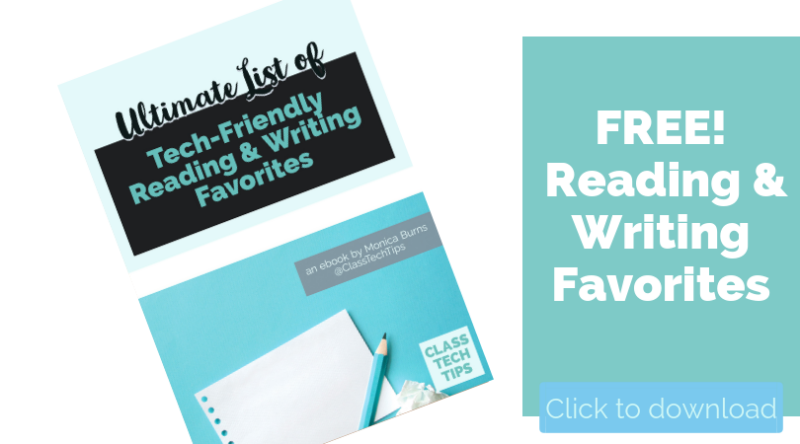 Earlier in this post, I mentioned how as a classroom teacher I tucked sticky notes inside my read aloud books. This helped remind me what to say during think alouds. 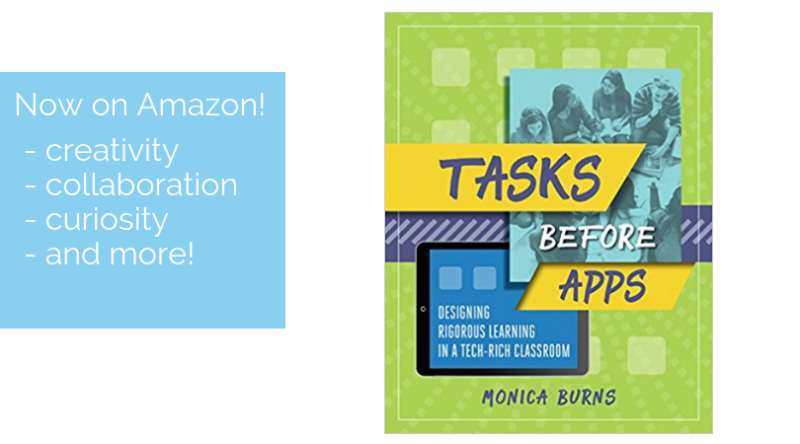 If you have sticky notes scattered across your classroom, you can capture them with the Post-It Plus app. This app actually works with any brand of sticky notes (like this one or this one) and I featured it on my blog several years ago. You can snap a picture of your notes for each book you’ve read. So even if you change classrooms from one year to the next, you’ll have your think alouds saved to your mobile app. 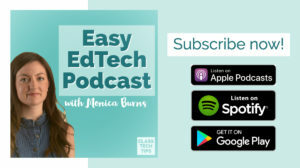 If you’re a regular follower of the blog (sign up here) you know that I am a huge fan of Flipgrid. You aren’t the only person in the classroom who can monitor and model their thought process with think alouds. If you ask students to record their thought process as they solve a math problem or tackle a tricky text, they can use Flipgrid. 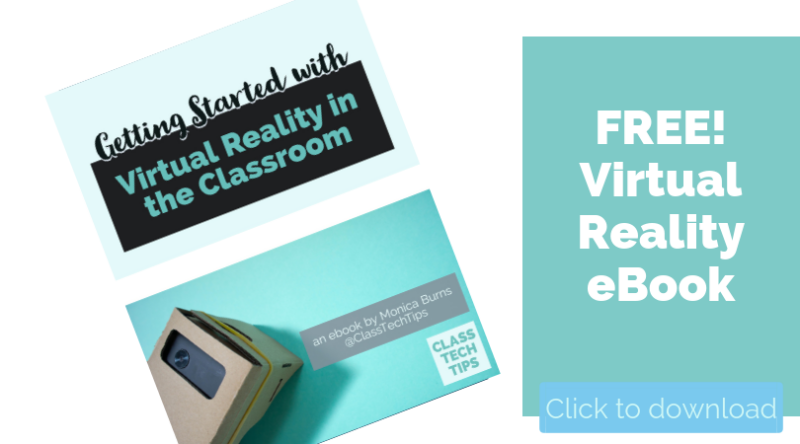 This video response tool is perfect for sharing student creations, participating in book clubs, and so much more. You can set up a grid for students, and they can record their thinking form any device. 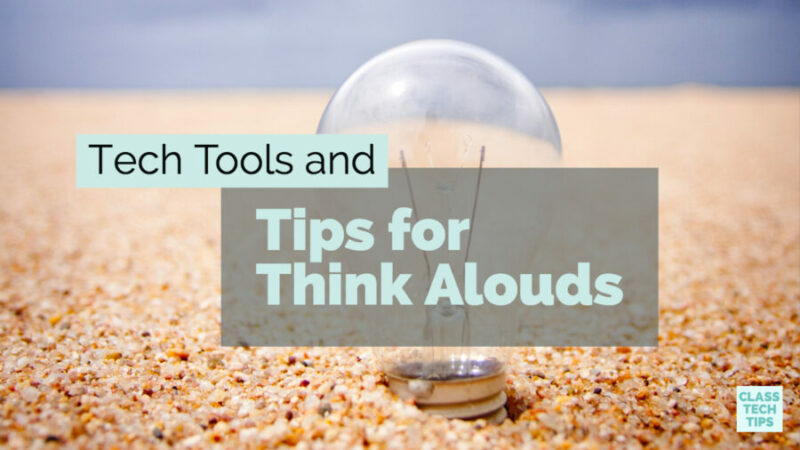 Whether you use tech tools or not, I hope these tips for think alouds will energize and elevate your instruction! Learn more about Dr. Molly Ness and her work by visiting her website or check out Think Big With Think Alouds, Grades K-5: A Three-Step Planning Process That Develops Strategic Readers!